As Cheminées Poujoulat climbed north out of the latitudes of the Roaring 40s and into a weather change on the east side of a high pressure system centred off the southern end of Brazil, Barcelona World Race leaders Bernard Stamm and Jean Le Cam are into relatively stable, quick downwind conditions which will allow them to make good miles north, ultimately to connect with the trade winds. After being dragged well to the east Stamm and Le Cam are now able to make more direct, easy miles north. 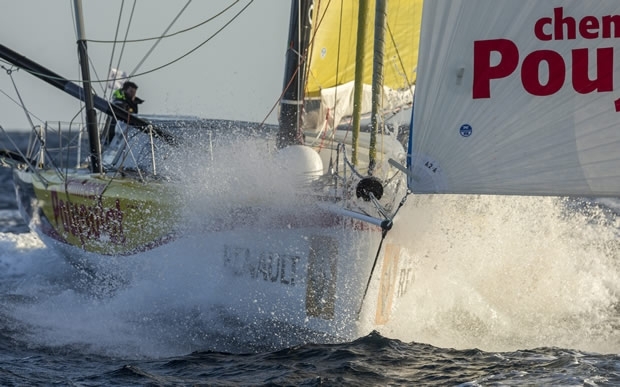 This Monday afternoon Cheminées Poujoulat had slowed in the light downwind conditions, but her Swiss-French crew will see the wind move to the southeast, allowing them a better, faster angle. By Tuesday they will have 20-25 knots from the ESE although as the high moves southeast they will be back into lighter airs by Wednesday. But in the meantime Stamm and Le Cam have had light airs and were only making 6.4 knots, currently due east of the mouth of River Plate between Argentina and Urugary. Guillermo Altadill and José Munoz on second placed Neutrogena have been making up miles today, dropping their deficit to Cheminées Poujoulat back below 1000 miles, thanks to their good reaching speeds in 20-25 knots of northwesterly breeze. But they, too, are due to encounter the high. The last 24 hours have been good for Neutrogena which has also made 95 miles on GAES Centros Auditivos. Spanish duo Anna Corbella and Gerard Marín have been through the lee of the Falkland Islands but are into clear air now, due east of the islands, and now pacing their arch-rivals Neutrogena, albeit 204 miles behind. We Are Water's Bruno Garcia may have spoken today about the complexity of their weather outlook for their next 1600 miles to Cape Horn, but the Barcelona brothers have been flying over the last 24 hours. Riding ahead of a depression they made 404 miles over the last 24 hours to this morning, but Spirit of Hungary has pipped them with a 415 miles day. Garcia commented: "We are at about 115 to 113° of longitude, so we are say 1600 miles from Cape Horn, but the approach is going to be a bit difficult. There will be many lows and we don't really know what they wil l be doing in these coming days. I think we will be crossing a little bit to he north but the situation will be quite difficult and tactical situation to but probably we will have enough wind." We Are Water is forecast to be at Cape Horn early Saturday morning with One Planet, One Ocean & Pharmaton later in the day. Renault Captur has been making steady speeds in the 14.5 to 16.5 knot range, suggesting they are on top of their rudder problems just now. And the high day's run for Spirit of Hungary signifies their best 24 hours yet in the Pacific. Conrad Colman was today delighted to have posted an 18.5 knots average overnight: "It is nice to be back at sea and going this fast, starting this stage with a bang. Thankfuly we have had an ideal re-start. We were absolutely exhausted. To go from skipper to shore crew and back again is hard. We did not get much sleep and in two and a half days I only got one shower. We were focused on the boat, not creature comforts. And then we had one night which was quite light at the start and then the reaching conditions have been building. we have been going absolutely flat out, going in an easterly direction and so we have been making miles and so it has been the perfect re-start. "At the moment we have 32 knots from the northwest and we are broad reaching and as you will have seen we have just averaged 18.5 knots all night which is awesome and our fastest run to date, so we are feeling good. We should eat our way through one quarter of the Pacific in essentially one long weekend. And so it is good work. After that the picture becomes more complicated." For Sale - Current leader of the GOR, fastest Class 40 on the planet.